“Uh…9? No. . Wait…” I answered, flustered because I can’t calculate in my head—I knew it lasted from the 8th to 13th centuries, but basic arithmetic slipped my mind at the moment. Our tour guide told the boy to go do the worksheet himself. 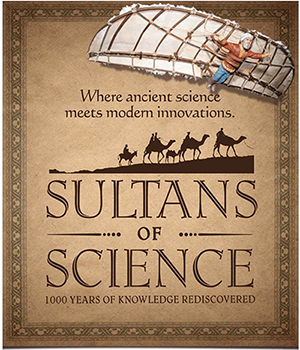 That was our introduction to the wonderful Sultans of Science: 1000 Years of Knowledge Rediscovered, a featured exhibit at the Ontario Science Centre. 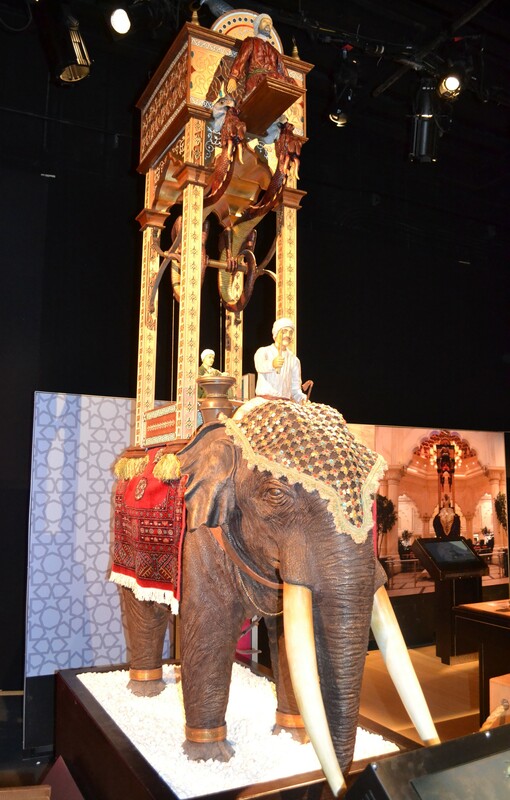 I became enthralled by the exhibit after seeing a photo of a replica elephant clock on Twitter, especially since I began learning about Islamic history of medicine and science a few years ago in order to add the topic as a module for my course on the History of Medicine. So I invited fellow historian Samantha Sandassie to visit the exhibit with me, to explore the history of Islamic medicine and chat about all things related to medicine, history, and random things of life. This remarkable machine is the work of al-Shaykh Ra’is al-Amal Badi’ al-Zaman abu-‘Izz Isma’il ibn al-Razzaz al-Jazari (1136-1206), a Muslim engineer who lived north of Baghdad under the Ayyubid Dynasty. He was named after his birthplace, Al-Jazari, a region in northern Syria and Iraq between the rivers Tigris and Euphrates in Mesopotamia; he lived most of his life in Diya Bikr in Upper Mesopotamia (now Southern Turkey). Approximately between 1174 and 1200, al-Jazari severed as the mechanical engineer to the Artuqid kings of Diya Bakir. Around 1198, al-Jazari began writing his extraordinary book, Al-Jami’ bayn al-‘ilm wa-‘l-‘amal al-nafi’ fi sinat’at al-hiyal (Knowledge of Ingenious Mechanical Devices), after spending twenty-five years at the Artuqid court. The book was written in response to the request of the Artuqid king Nasir al-Din Mahmud ibn Muhamma; al-Jazari completed the book shortly before his death. The book is an outstanding contribution to mechanical engineering, a compendium of both theoretical and practical mechanic, and beautifully illustrated. 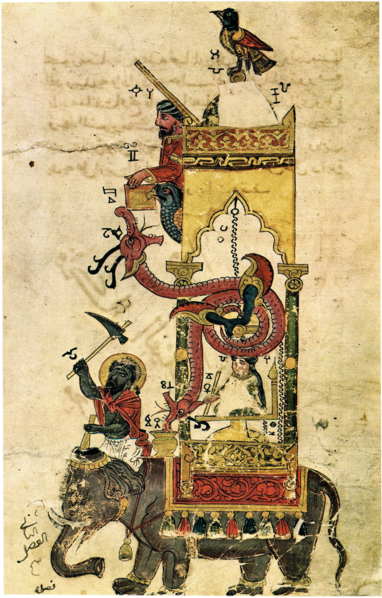 Al-Jazari describes fifty different types of machines in varying complexity, including: 10 water clocks; 10 designs of automata vessels for dispensing water and wine; 10 designs of water dispensers for bloodletting devices; 10 fountains and musical automata; 5 designs of water raising machines; and 5 machines or instruments for measuring spheres and locks. The book is not a theoretical compendium, but a practical guide—al-Jazari even includes how his water designs can be used for irrigation and domestic purposes. 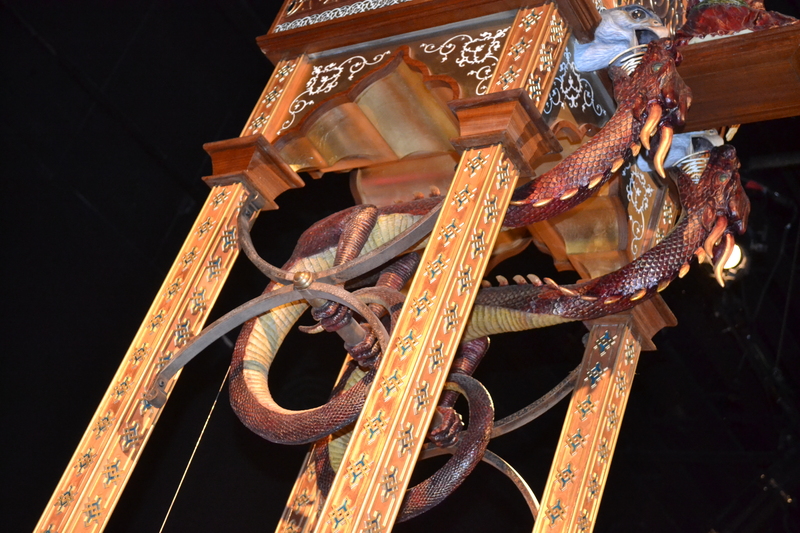 The Elephant Clock is an intricate testimonial to the cosmopolitan nature of Islamic science and is a reflection of al-Jazari’s many travels. 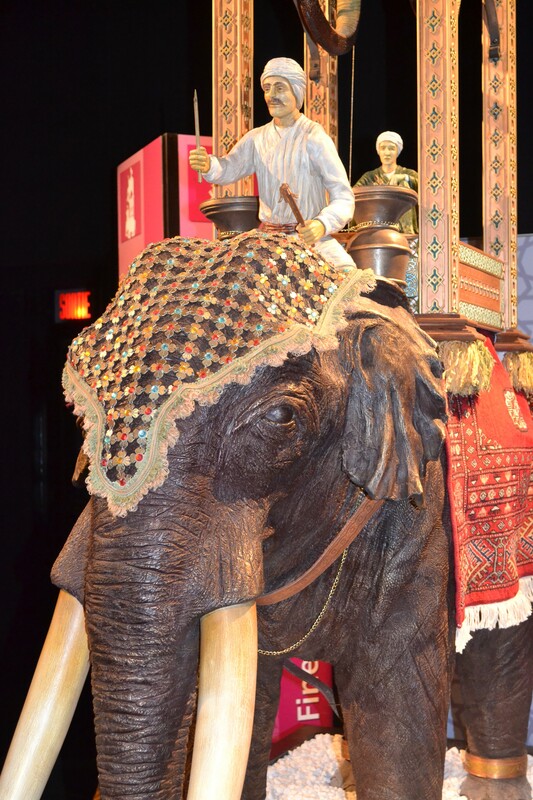 The elephant represents both Indian and African cultures; the dragon, Chinese; the phoenix, the ancient Egyptians; the water flow a representation of ancient Greek architecture; the Persian carpet; and the turbaned man on top of the elephant, Islamic culture. The earliest water clocks were simple devices used mostly for astronomy and astrology. By the 12th century, water clocks became complex marvels of engineering skill and craftsmanship, as the accuracy of clocks and time-keeping were improved by the addition of automated control systems used for regulating prayer times. The Elephant Clock’s timing mechanism is based upon a water-filled bucket that is hidden inside the elephant, taking half an hour to fill. The pulley system releases a ball that tips the water sound each half-hour. You can see the actual mechanics of the clock in this video. Special thanks to Anita Lennon and Sebastian Assenza for their generous hospitality and to Samantha for putting up with my constant photography. His full name indicates his titles: Ra’is al-A’mal means he was a chief engineer; Badi’al-Zaman means he was unique and unrivalled; and al-shaykh indicated he was a learned and dignified scholar. For instance, see: Gerhard Dohrn van Rossum, History of the Hour: Clocks and Modern Temporal Orders (Chicago: University of Chicago Press, 1996).